Keiichi has recently moved from the big city to the village of Hinamizawa. For the first time in his life, Keiichi is now exposed to simple country life – a life he thinks is peaceful and tranquil. However, it does not take long before things begin to fall apart at the seams and for paranoia to overcome sensibility. If you watch it, DO NOT miss a single episode. That’s because the plot is very complicated. There are no answers or explanations given for the events taking place until the very end of the series and you’re forced to make your own deductions up until then. Not that making deductions will do most people any good since the story has been very cunningly compiled and will likely misdirect you; making you think that you were wrong about something only to discover later on that you were originally on the right track. Aside from a brilliantly evil little storyline, the show also does take time out for a few laughs, and mundane moments. That combined with a very surreal intro theme make for a very creepy and looming atmosphere. The artwork and animation aren’t really worth a mention but to say that the CGI waterwheel was most off-putting. Still, this hardly matters when stacked up against the very clever writing and directing along with some fairly apt character development. Overall it’s a good series and I personally thoroughly enjoyed it but I don’t think it’s for everyone. If you like lots of action, humour and straightforward plots, then I wouldn’t recommend Higuashi no Naku Koro ni to you because it’s far more artistic than entertaining. The complicated plot is likely to give many people a migraine and some may even find it a little on the slow moving side. If you enjoyed Jigoku Shoujo then there’s an above average chance you’ll enjoy this. 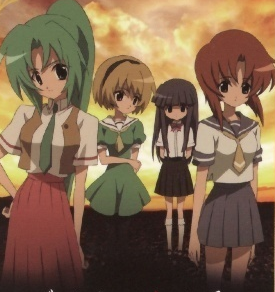 Higurashi no Naku Koro ni originally started life as a dojin game back in 2002. It was well received which is likely why eight total games including one bonus disc have been released thus far. Along its journey, Higurashi no Naku Koro ni has been adapted into an anime, two live-action films, a manga series and a light novel series. The anime continues in a sequel, Higurashi no Naku Koro ni Kai, of 24 episodes in length. This entry was posted in O-Blogive, Otakudom and tagged Anime, Cicada, Higurashi, Higurashi no Naku Koro ni, Review, Studio Deen, When the Cicadas Cry on January 11, 2010 by nonzyro.